When wandering through the parks and gardens around Kirkland and the whole Seattle area, you will likely see these plants in the early spring onward, if you know what to look for. Maybe you are fortunate enough to have them growing in your own yard or garden. Make sure to properly identify the plants, find a relatively clean patch and rinse the plants well before eating fresh/raw if they’re not from your own garden. 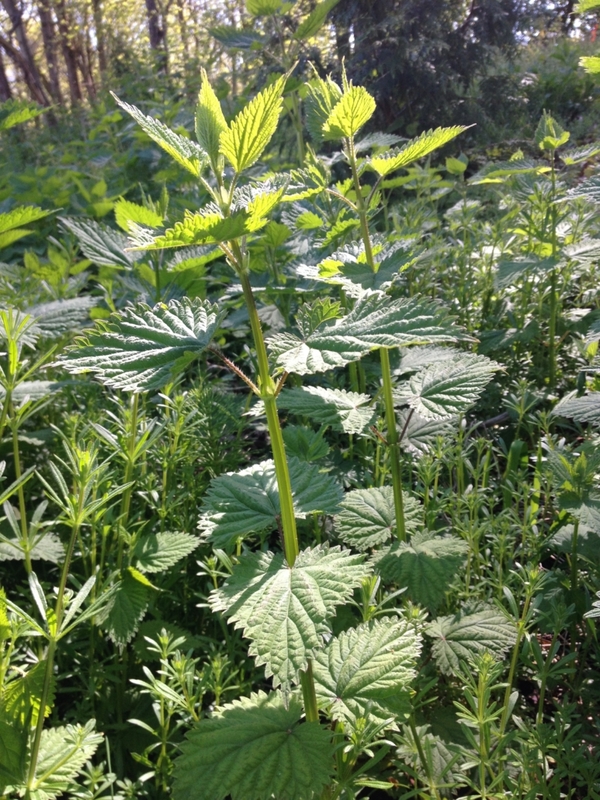 With Nettle (aka Stinging Nettle), you’ll need to use gloves to harvest. Chickweed – the whole upper parts are used of this low-growing plant that loves moist, cool weather. High in minerals like iron and calcium, chickweed is also high in purifying chlorophyll. Chop and add to salads, juice it, or make a long infusion by soaking in cold water for 4-8 hours and drinking as a tea. Topically, this plant is a soothing, anti-inflammatory, and antipruretic (anti-itch) skin herb. It can be applied as cooling poultice, or infused in oil (such as olive oil) and applied or made into a salve. Internally, the fresh plant tincture can help with water retention and weight loss as the minerals and chlorophyll can help with boosting metabolism. Cleavers – the upper parts are used before flowering of this sprawling, sticky plant with its unique whorled leaf pattern. This plant is mineral rich, high in chlorophyll, and acts as a diuretic (increases urinary flow through the kidneys) and lymphagogue (helps move lymphatic fluid). This makes it a great spring tonic, good for skin and kidney health, and for supporting the lymphatic system and lessening water retention. Dandelion leaf – The young leaves are used in the spring as a great spring tonic. They are bitter in taste and are a classic liver tonic and detoxifier, as well as a bitter digestive tonic to stimulate the flow of digestive juices. The leaves are also a strong diuretic, helping to move fluid through the kidneys and reduce water retention and swelling. The leaves are great eaten fresh in the spring in salads and are high in potassium among other minerals, so doesn’t deplete the body of this important mineral when used as a diuretic. Nettle leaf – Urtica dioica, commonly called nettle or stinging nettle grows naturally in the Pacific Northwest. The leaves and stem are covered in tiny hairs that contain formic acid, which is irritating to the skin if touched. This uncomfortable property dissipates when the plant is dried and crushed, and disappears when cooked. The leaf is high in minerals like iron, calcium, and magnesium, as well as chlorophyll. The leaf is most commonly used, but the root and seed both have medicinal properties. The leaf helps reduce allergy symptoms by lowering histamine release, so is great to consume this time of year. I like to recommend its consumption as an herbal tea, ideally made into a long infusion by steeping cold or hot for 4-8 hours. It can also be added to food or smoothies as a powder. When harvested fresh, it can be added to any cooked dish that calls for spinach or other leafy green.